It’s easiest to describe The Mozilla Defense Platform (MozDef) as a set of micro-services you can use as an open source Security Information and Event Management (SIEM) overlay on top of Elasticsearch. The inspiration for MozDef comes from the large arsenal of tools available to attackers. Open source suites like metasploit, armitage, lair, dradis and others are readily available to help attackers coordinate, share intelligence and finely tune their attacks in real time. Open source options for defenders are usually limited to wikis, ticketing systems and manual tracking databases attached to the end of a commercial SIEM. The Mozilla Defense Platform (MozDef) seeks to automate the security incident handling process and facilitate the real-time activities of incident handlers. Provide a platform for use by defenders to rapidly discover and respond to security incidents. Scalable, should be able to handle thousands of events per second, provide fast searching, alerting, correlation and handle interactions between teams of incident handlers. Integrates with a variety of log shippers including logstash, beaver, nxlog, syslog-ng and any shipper that can send JSON to either rabbit-mq or an HTTP(s) endpoint. Frontend processing for MozDef consists of receiving an event/log (in json) over HTTP(S), AMQP(S), or SQS doing data transformation including normalization, adding metadata, etc. and pushing the data to elasticsearch. Internally MozDef uses RabbitMQ to queue events that are still to be processed. 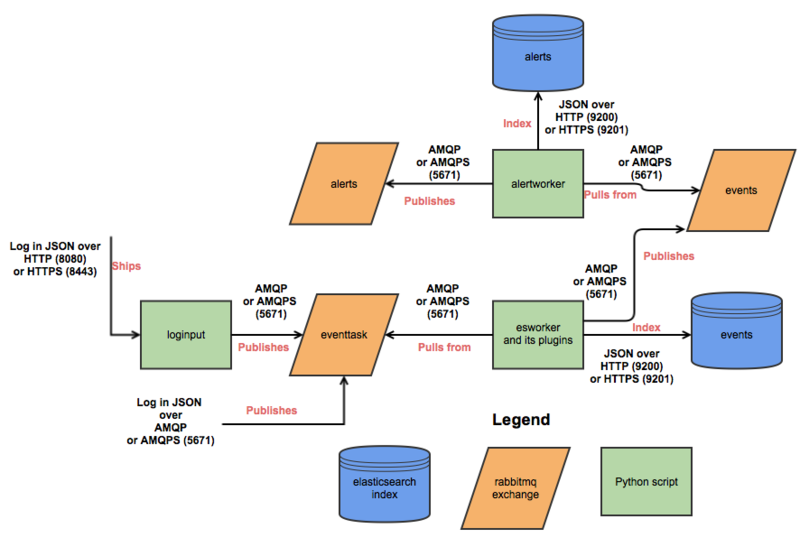 The diagram below shows the interactions between the python scripts (controlled by uWSGI), the RabbitMQ exchanges and elasticsearch indices. MozDef has been in production at Mozilla since 2014 where we are using it to process over 300 million events per day.